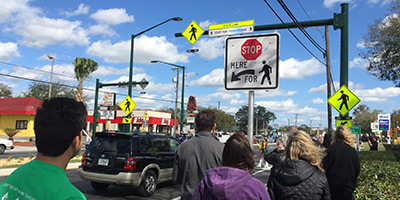 On January 27th, 2015, Hillsborough County celebrated the completion of the Fletcher Avenue Complete Streets Pedestrian and Bicycle Safety Improvements. A crowd of state and local officials, engineers, planners, students, and citizens heard remarks from County Commissioners Kevin Beckner and Victor Crist, as well as Sheriff’s Major James Burton and FDOT District Safety Engineer Ron Chin. USF cheerleaders and mascot Rocky also made appearances. On a typical day, 1,400 people cross Fletcher Ave. The $5 million Complete Streets project re-engineered an area of high pedestrian use on Fletcher between Nebraska Ave and 50th St to improve pedestrian and bicyclist safety. The project was completed with the help of $3 million in Federal Highway Administration safety funds through the Florida Department of Transportation. The project also installed additional sidewalks near the University of South Florida, upgraded handicap access ramps at crossings and intersections, and reduced the speed limit to 35 miles per hour. An additional mile and a half of marked bicycle lanes also created a 3-mile continuous segment along Fletcher Avenue between Nebraska Avenue and 50th Street. More information on the Fletcher Avenue Complete Streets project is available at www.HillsboroughCounty.org/CrossSafe.